The Tot Founder and mama of two, Nasiba Adilova, reviews the new non-toxic, educational, eco-friendly and totally fabulous Lovevery Play Gym. I know I get excited about a lot of things when it comes to products for kids, but the Lovevery Play Gym is seriously amazing. Created by mama of three, Jessica Rolph, and dad of two, Rod Morris, this play gym is on a mission to help your tot reach important milestones, while bringing style into his or her play space. Designed by a team of academics, researchers and practitioners, the Lovevery Play Gym is simple, sleek and one of the most versatile products you can get for your tot. It’s no secret that play gyms are one of the best activities your baby can do. They’re great for tummy time and play time, however, we now know just how crucial they can be for helping your baby’s cognitive development. In the first year of life, babies are sharpening their eyesight, learning cause and effect, developing fine and gross motor skills and trying to interpret the world around them. They’re also teething, strengthening their core, back and neck muscles and on a constant mission to stay entertained. So what makes the Lovevery Play Gym different than others on the market? Unlike other play gyms that usually only work for about 3-6 months, it has a stage-based play guide to provide a full year of play and activities for parent and baby. 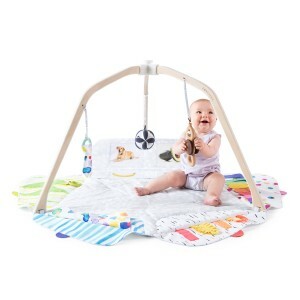 From batting to teething to learning to focus, this play gym has sensory materials that your baby can safely explore. It features five development zones that reveal or conceal to prevent over-stimulation, and promote everything from making sounds, learning to focus, hiding and finding, exploring colors and more. It comes with an organic cotton teether with a BPA-free silicone ring, organic cotton Montessori ball as well as an ergonomically designed wooden batting ring. The Lovevery Play Gym has high contrast cards that will help your tot develop their eyesight and vocabulary. It is made out of FSC sustainably harvested wooden legs and water based non-toxic finishes. The play mat is machine washable. Once your tot gets a bit older, the play gym can transform into a tent, giving it longevity. There are many things to love about this play gym, but I especially love the ethos behind the brand. On their website, Jessica writes that when she first had kids, she read a doctoral dissertation titled, Current Research Findings on the Neurological Development of Infants. Through reading the study Jessica learned that the human brain has about 100 billion nerve cells, all of which are present at birth but have few links between them. Babies’ brains develop by constructing an intricate communication network. The network’s structure is formed by experiences children have in the first 3 years of life. The research revealed the more you expose babies to how the world works, the richer the neural networks become. Jessica’s takeaway was that early-development experiences wouldn’t just happen on their own, she had to create them. And that’s exactly what she and Rod have done! Here is my full review of the fantastic Lovevery Play Gym!